Needham is a cohesive community that supports all of our youth to grow, and develop to be substance free and healthy in mind, body, and spirit. The coalition incorporates a collaborative, community based, and data driven prevention approach to reduce alcohol, marijuana and other drug use among Needham youth. Through community education, partnership and strategic action, we decrease the risk factors and increase the protective factors associated with substance use to enhance the health and safety of our youth. Our coalition meets the first Tuesday morning of each month from 7:15 to 8:30 AM at the Needham Public Library sharing an open and honest dialogue on the high risk behaviors and substance use and abuse issues confronting Needham youth. The meetings this year meetings were regularly attended by 15 to 20 Needham community leaders, parents, and youth. 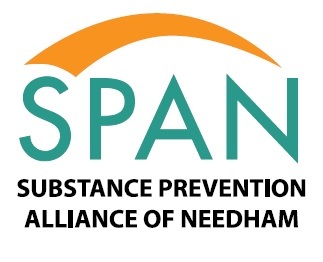 SPAN members discuss the biological, psychological, and legal consequences of underage substance use and how their prevention work can positively impact Needham youth and adults. Research shows that multi-sector, multi strategy approaches to substance abuse prevention, implemented by community coalitions, reduce alcohol and other drug use significantly. Our members are committed to implementing Environmental Prevention Strategies that impact access and availability, policy and enforcement, media advocacy and community norms. To prevent and reduce youth access to alcohol, marijuana, and other drugs. To change attitudes and social norms towards youth alcohol and substance abuse. To increase protective factors that prevent youth alcohol and substance abuse in Needham. The coalition routinely hosts events to foster the educational and collaborative nature of it's mission. Please check our events listing to learn about our past and future events.